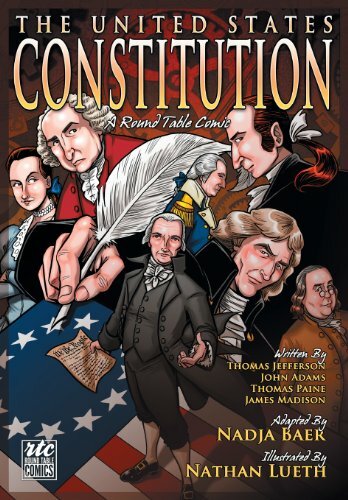 The United States Constitution: A Round Table Comic Graphic Adaptation by Nadja Baer is an odd little book. On its surface it serves as an educational comic, tracing the history of the American Constitution from the convening of the first convention in 1787 all the way through its ratification in 1790. Less of a story and more of a montage of characters, events, and ideas, the book combines excerpts from the original documents and historical factoids alongside scenes of the founding fathers which summarize their opinions on the various elements of the drafting of the Constitution. Then about a third of the way through the book and seemingly without explanation, these historical characters are suddenly joined by a cast of anonymous steampunk characters who appear to provide a visual representation of the concepts from the Constitution explained in the book. If you’re confused, so was I. These character designs aren’t necessarily bad, but why they’re there is entirely unclear. As well, the introduction of other steampunk elements—robot troops representing Congress’s right to raise armies and an airship appearing to combat piracy—is awfully random, particularly when no explanation is provided. One thing The United States Constitution: A Round Table Comic Graphic Adaptation does very well—aside from being quite thorough and including the entire document of the Constitution—is highlight how contentious the actual process of drafting the Constitution—and later the Bill of Rights—really was. There is a mistaken impression among many Americans today that the Constitution is a sacred document, penned by a group of saints known as the “Founding Fathers,” infallible in its makeup, and whose concepts are obvious. The truth of the document’s design is anything but; and The United States Constitution goes into a good portion of the ideological contention between the founders and the political turmoil that almost caused the Constitution to not be. The story also does a good job of pointing out the gross inequalities (from a contemporary perspectives) inherent in the original document, as well as the many changes that have been made to the document over the years—for good or ill. The book demands a degree of familiarity with American history since many of the characters and concepts are introduced in context but the context is rarely explained; thus the book hurtles forward, switching regularly between conversational vignettes, conceptual (steampunk) representations, and long panels of text. Raising as many questions as it answers, The United States Constitution: A Round Table Comic Graphic Adaptation is not truly “educational,” but for those seeking a straightforward (for the most part) depiction of the struggles and history of the Constitution, this graphic adaptation, despite all its oddities, is certainly more engaging than a simple prose history.